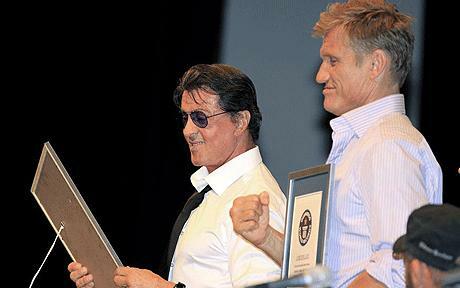 It has been a year since main footage of “The Expendables” has wrapped. I feel privileged as someone who was given a unique opportunity to take part in this epic project. I am a lifelong sportsman and becoming a fan of Sylvester Stallone, Arnold Schwarzenegger and their films was just a step away. Being “Stallonized” and “Arnoldilized” at a very young age, I have become a writer and an actor, started studying film and gradually added to my almost twenty years as a swimmer a decade and a half lifting weights, dreaming and (being laughed at! Well…) that someday I would work with my idols. All of my letters and attempts to reach them failed. I insisted on the “Hollywood Dream” mainly working with theater productions, some film and TV appearances in Brazil. After almost twenty years developing an interesting love/hate relationship with the United States Post Service, based on “Return to Sender”, (no, I am not talking about an Elvis song), “no”, “sorry” and many times a frustrating silence, at last, I got my shot to work with THE MAN. Being born in Rio de Janeiro and not knowing how to speak English made things a little slower than I expected. I learned basic and intermediate English by myself, devouring books, magazines and movies. Formal English schooling was achieved years later working as a swimming teacher and coach. A few more years and I had a career as an English teacher, leading to bilingual sports announcer, language school entrepreneur and a Governor of the American Society of Rio de Janeiro. But the sparks of movie dreams were always there, they never ceased to burn. “There was still some stuff in the basement”. My screenplays gained meaning and depth; the acting improved its consistency, the weights on the barbells and dumbbells also increased. My inner Rocky Balboa always saying “…it ain’t about how hard you hit. It’s about how hard you can get hit and keep moving forward…” and the Rambo within my soul constantly defying me in the mirror, “day by day”. My routine was writing/acting/working/exercising, word by word, pound by pound. During an interview years ago legendary Producer/Director/Writer Irwin Winkler stated that “nothing can stop a struggling actor”. I do believe it’s true. Once upon a time “The Expendables” land in Brazil. I get a job exactly one day before we start shooting in the small town called Mangaratiba. I do my best (working as Sly’s stand in) and I try to get as busy as I can to help everyone on the set. My efforts are worth some comments in the official blog of the production, and despite my contribution to the film is quite modest, it allows me to “learn something while doing something else”. Hollywood moves fast and now Barney Ross (I mean Stallone, not the late Barney Ross, of course – World Champion Boxer and WWII Decorated Veteran) and his team go to New Orleans. And so do I. The quality of the technical knowledge, artistic vision and human interaction I have at my disposal is priceless and only after realizing my memory would betray me, I start taking notes on the set. I write hundreds of notes about directing, acting, lights, lenses, cameras, angles, stunts, props, screenplay techniques and all sorts of memories that come to my mind. Flashes of my entire life cross my mind while on set. Avi Lerner, Kevin King, John Thompson and Les Weldon, the producers, are very supportive and whenever they have some spare time, they share their knowledge and expertise patiently answering my questions. The amazing Jeffrey Kimball is always very supportive, he sees my eagerness to absorb all that knowledge and suddenly I catch myself learning from the director of photography of Top Gun! The whole crew is very interested and helpful to me. The gorgeous Celeste Salzer (Assistant to Stallone) tells me in our last day shooting in New Orleans, Louisiana: “Sly has the power to inspire people”. And oops, he did it. Again. 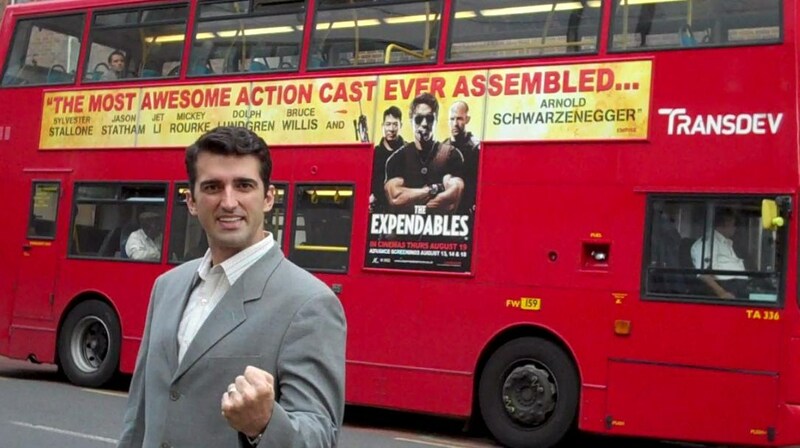 Being so close to the action and constantly hearing the always efficient Richard Fox (First Assistant Director) saying “watch and learn” gave me a clear idea of why “The Expendables” is undoubtedly a huge hit and an instant Classic Action Movie: Determination. Sly gets thrown, punched, kicked, shot, stabbed and has frequent visits to the hospital while the rest of us go home to rest. Yet, he is always impressively focused and very energetic, shouting: “Come on, we have a movie to make!” He gives his best shot and demands the same from his team. I give my blood, sweat and tears to it. Quoting Clint Eastwood: “My father used to say to me, “Show ’em what you can do, and don’t worry about what you’re gonna get. Say you’ll work for free and make yourself invaluable.”” And I am willing to do my best and am proud to be part of it. That’s a wrap and I approach Sly. After a quick chat talking about my (hi)story to him, I proudly show him a Creative Artists Agency reply of a letter (my first official “no”) sent by a certain young Daniel Bertorelli trying to contact him back in 1995. Sly tells me: “You know, you are a very determined young man”. Very determined? Hum, not bad at all. What an honor, considering the source of the comment was the Italian Stallion himself! Mission accomplished, at least this one. Sly gives an advice to aspiring young actors and writers on the extra features of the Rocky DVD: “Don’t give up. Keep talking. Eventually you might hit a nerve somewhere!” Real dreams, old dreams, some will say you have pipedreams, whatever. In the end it is all about dreaming, throwing an arrow and running after it. I love the poem “A Dream Within A Dream” by Edgar Allan Poe, where we read: “All that we see or seem is but a dream within a dream.” (no humor or pun with the great and brand new Christopher Nolan’s / Leonardo DiCaprio “Inception” intended at all…). And what was the outcome of my physical and emotional rollercoaster? I concluded that DREAMS ARE NOT EXPENDABLE! DARE TO DREAM YOUR DREAMS, BE BOLD, FIGHT THE GOOD FIGHT. Give it your best shot and pay the price. Sooner or later you’ll get there. I could not finish without thanking in its entirety “The Expendables Family”, all my family and friends. My greatest wealth is my friends, the new and the old ones! Avi Lerner, Kevin King Templeton, John Thompson, Les Weldon, Danny Dimbort, Trevor Short, Boaz Davidson, Robert Earl, Jeffrey Kimball, Celeste Salzer, Sheryl Main, John Herzfeld, Dolph Lundgren, Jason Statham, Jet Li, Mickey Rourke, Terry Crews, Eric Roberts, Randi Couture, Steve Austin, David Zayas, Gisele Itie, Antonio Rodrigo “Minotauro” Nogueira, Antônio Rogério “Minotouro” Nogueira, Charisma Carpenter, Marcio Rosario, Richard Fox, Scott August, Aeron McKeough, Gary Daniels, Paul Parlavecchio, Samantha Hazen, Vern Nobles, Richard “Rick” Osborn, Jody Miller, Dan McDonough, Michael Applebaum, Frank Parish, Nicolas “Nick” Restrepo, Peter Roome, Autumn Boh, Sean Fairburn, Karen Ballard, Michaele Shapiro, Henry Pelitire, Jeff Taylor, Charlie Nauman, Paul Uddo, Shannon Parker, Joshua Throne, Rob Van Norden, Franco-Giacomo Carbone, Donna Cushing, Kent Johnson, Audrey Johnson, Lizz Wolf, Mustapha Mimis, Mark Shane Davis, Rock Galotti, Scott Eddo, Nicole Venables, Donna Spahn, Christy Wyatt, Amy Wood, Stacy Kelly, Adam Ryan, Chad Stahelski, Noon Orsatti, Stephanie Panying, Eddie Fernandez, Hank Amos, James Logan, Jared Eddo, Jon Valera, Stanimir Stamatov, Tony Messenger, Amy Sanderson, Andy Weder, Johnny Franco III, Wes Caefer, Paul Block, Janaina Amorim, Marcos Romero, Terry Leonard, Jennifer Stallone, Patrick King Templeton, Bryce Fins, Craig Zablo, Tatsu Carvalho, Marcio Farjalla, Julio Alfaya, Jone Brabo, Rosa Fernandes e a Divina Providencia, Cacau Medeiros Sr., Cacau Medeiros Jr., Romulo Bondim, Andrea Amorim, Correa, Roberto “Bob” Rico, Ana Claudia Rebello, Daniel Becker Gnattali, Sergio L. Meyer Portugal, Tom Sluberski, Dennis Grannan, Sean Jacobsohn, Corey Scholtka, El Ammari Zakaria, Mauricio Bara, Marcelo Brou, CBDA Team, Ricardo Cabral, Roberto Cabral, Giovana Moreira, Edmundo Rodrigues, Claudio Cardone, Jess Taylor, Flavia Zanini, Lindsay Duval, Paulo Freitas Ribeiro, Rodrigo Perez, Ivan de Faria Vieira Jr., Fabrizio Feliciano, Mauricio Romano, Marco Pierangelini, Morris Gilberto Israel, Bruno Roberto Marinho, Luis Antonio “Popo”de Jesus, Sebastian “Maisena” Pitassi Jr., Cacaco Nagem, Michelle Campos, Cesar Tartaglia, Livia Calmon, Cesar Romero, Renato “Cat” Melo Ferreira, Rodrigo “Bullet” Melo Ferreira, Marcus Vinicius Gontijo, Marcos Motta Secco, Marco Antonio Cadete, Luzia Cadete, Raphael Cadete and Sansarah Bertorelli. And last but not least, a very special thanks to the man whose career and life has always inspired me and has made it all possible: Sylvester Stallone. Awesome, man. Amzing post and congratulations! Unearthed your site via live search the other day and absolutely like it so much. Continue the truly great work. Who’s the least expendable of “The Expendables”?